Each year on World AIDS Day, December 1, the world unites in the fight against HIV. It is estimated that 34 million people around the world are living with HIV and over 25 million people have died from the disease since 1981. The good news is that strong investments in HIV/AIDS research have resulted in remarkable scientific advances such as new prevention tools and drugs that allow individuals to manage their disease. However, there is still much more work to be done and World AIDS Day highlights the need for continued investments in research, education and improved access to treatment. It is also important to raise awareness of another category of diseases that can undermine efforts to eliminate HIV: neglected tropical diseases (NTDs). NTDs affect over 1.4 billion people and there is significant overlap between NTD and HIV infection in many areas of the developing world. For example, females with schistosomiasis in Africa have a nearly 3-fold risk of HIV infection. Co-infection with HIV and NTDs like leishmaniasis or hookworm can dramatically worsen symptoms and speed up the progression of HIV to AIDS. Advances in HIV/AIDS prevention and treatment have proven the incredible power of research to save lives and we must not retreat on our progress in the face of scientific advances. Funding for global health research and development that includes the advancement of new and improved tools against NTDs and HIV/AIDS will yield multiple benefits for our health. Smart and steady investments in global health R&D will help us realize our shared visions of a generation free from these debilitating diseases. On November 13, a documentary series called “The Future Files” premiered on Georgia Public Broadcasting. Created by the Georgia Research Alliance (GRA), a Research!America member and partner, the series highlights Georgia researchers working to address some of the most challenging problems facing our world today. The first episode focuses on the threat of influenza and details recent efforts by Georgia scientists to develop a vaccine. Future episodes will focus on issues ranging from new energy to cancer to regenerative medicine. The pilot episode is designed to bring to life some of the outstanding health research taking place every day in Georgia laboratories. Due to the tireless efforts of GRA and other Georgia-based health organizations, the state has become a key health research hub in the U.S. GRA has worked to expand research capacity at universities, launch new companies and foster the development of 28 nationally recognized Centers of Research Excellence. GRA has even encouraged research on neglected tropical diseases, investing in the Center for Tropical and Emerging Global Diseases (CTEGD) at the University of Georgia. Researchers at CTEGD are working to develop new treatments for schistosomiasis, African sleeping sickness, Chagas and cysticercosis. To learn more about this center and other GRA investments, visit http://gra.org/ProgramsInitiatives.aspx. To watch the first episode of “Future Files” online, visit www.gpb.org/future-files and be sure to stay tuned for rest of the series! To learn more about Research!America’s work in Georgia, please visit www.researchamerica.org/gh_georgia. It started in Tennessee: one patient with an unusual recurrence of meningitis. An infectious disease specialist at Vanderbilt University worked the case like a detective, tracking down a lead. When the detective work led to an unusual suspect – a possible contamination – the Tennessee Department of Health was promptly notified. And when Tennessee public health specialists feared the contamination might be widespread, they contacted the Centers for Disease Control and Prevention (CDC). In short order, a second federal agency, the Food and Drug Administration (FDA), and most states in the eastern half of the country were working to solve a puzzling fungal meningitis outbreak that affected thousands of people. Although the outbreak continues, much has been accomplished thus far to protect the public’s health. The contaminated medicines have been recalled, the company that produced them has been closed down, and nearly all of the people who may have been infected have been contacted. The incident serves as a front-page reminder of the critical role that public health professionals play every day. According to ABC News, the initial diagnosis came from April Pettit, MD, an infectious disease specialist at Vanderbilt University. A patient she treated for bacterial meningitis was readmitted to her hospital. Pettit ordered more exhaustive testing, which led to a rare diagnosis: aspergillus meningitis, which is caused by a type of fungus. Pettit talked with the patient’s family members to try to discover how such an infection could have taken place. Soon, she found a possible answer. The patient had received a steroid shot four weeks earlier to relieve back pain. Sensing there could be a connection, Pettit contacted the Tennessee Department of Health. That contact led to Marion Kainer, MD, MPH, who is in charge of the state’s health care-associated infections prevention efforts. She confirmed the details of Pettit’s patient just as other cases in the Nashville area were popping up. Three days after Pettit’s initial contact with Kainer, the state alerted its health care network about the potential outbreak. As CDC began to accelerate its role – it had been consulted since the beginning – the FDA also became actively involved in the investigation. On September 27, the CDC – after putting out a nationwide alert – received a report of fungal meningitis from North Carolina. As the picture became clearer, more states became involved and CDC devoted more of its personnel to the investigation. Because of the urgency of the situation and the large number of people at CDC focusing on the outbreak, the agency decided early on to activate its Emergency Operations Center (EOC). While some people may think such a facility is primarily for natural disasters, Weber said the outbreak certainly qualified as a man made disaster. Indeed, the EOC had a crucial role in CDC’s response during the H1N1 pandemic and, had it existed in 2001, would’ve been used for responding to the anthrax attacks, Weber said. The EOC diverts CDC personnel from their normal duties, so Weber said the decision to activate it is not made lightly. But because of the demands of the outbreak – such as helping states with outreach to thousands of people, pulling together needed CDC experts into a centralized location – activating the EOC early in the fungal meningitis response made sense. Weber noted that one of CDC’s objectives was to support the states during the response, and he believes that mission has been achieved. As an example, CDC has facilitated daily conference calls with all of the 23 states that received shipments of the contaminated steroids, resulting in discussions and exchange of current information among state officials. And CDC supported the states’ efforts to reach hospitals, clinics, professionals and patients who were affected. The reality is that such large-scale outbreaks are thankfully rare. But CDC collaborates with health departments from across the country on a daily basis. At points during the outbreak, agency officials were in contact with all 50 states to keep them up to date on developments. There’s still more to be done. Because fungal meningitis was so rarely seen prior to the outbreak, Weber likened it to a new disease; there is virtually no historic clinical information to rely on. CDC continues to focus on learning more about the fungal meningitis and other illnesses linked to this outbreak, and providing interim guidance on how to treat those who have been affected. On Public Health Thank You Day, the fungal meningitis outbreak reminds us of the invaluable contributions of those professionals working behind the scenes to ensure that Americans stay safe. Even if you’ve never heard the term “mycotics,” or “healthcare-associated infections”, it’s good to know that there are people who are experts in these infectious disease threats, and that they’re looking out for us every day. Every year we celebrate Public Health Thank You Day the Monday before Thanksgiving day. Be sure and thank your local public health professional today and every day. 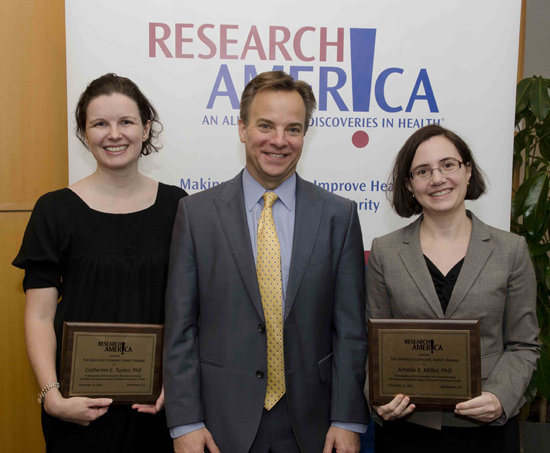 From left, Catherine Tucker, PhD; Research!America Board member Mark McClellan, MD, PhD; and Amalia Miller, PhD. Tucker and Miller are the recipients of the 2012 Garfield Economic Impact Award. From left, Research!America Board member, Hon. Kweisi Mfume; Research!America President and CEO Mary Woolley; National Journal Daily editor Matthew Cooper; and Research!America Chair Hon. John Edward Porter. 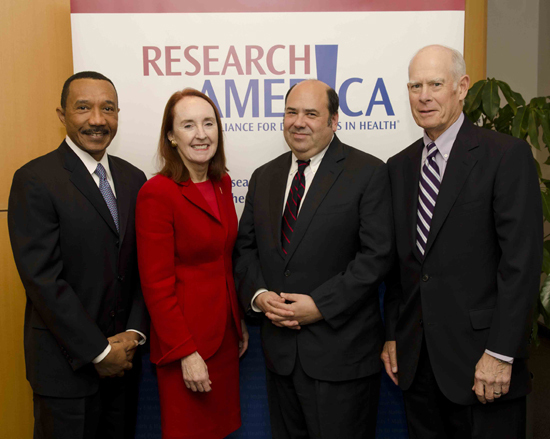 From left, Research!America President and CEO Mary Woolley; National Journal Daily editor Matthew Cooper; Research!America Board member and chief executive officer of the American Association for the Advancement of Science Alan Leshner, PhD; and Research!America Chair John Edward Porter. Alexandria, VA –November 15, 2012–The authors of a landmark study on the use of electronic medical records (EMRs) to reduce infant mortality will receive the 2012 Garfield Economic Impact Award. Amalia R. Miller, PhD, and Catherine E. Tucker, PhD, are being honored for their paper, “Can Health Care Information Technology Save Babies?” The award, presented by Research!America, recognizes economists whose work contributes to our understanding of the ways in which medical and health research – and new, research-based technologies and treatments – impact the economy. The award is supported by a grant from Merck & Co., Inc. The study, published in Journal of Political Economy, provides solid evidence that creating an electronic rather than a paper interface between patient information and health care providers reduces neonatal mortality. They further demonstrated that the cost of EMRs used for this purpose is minimal when measured against the societal benefits. The findings are particularly important given that the U.S. has struggled for years to reduce infant mortality rates, according to the paper. Each year, 18,000 babies die in the United States within their first 28 days of life. According to the authors, this high rate of neonatal mortality means that the United States is ranked 43rd in the world and lags behind 24 of the 27 members of the European Union. Using a 12-year county-level panel, the authors found that EMRs reduced neonatal mortality by 16 deaths per 100,000 live births. The authors credit this decrease to the fact that EMRs facilitate fast and accurate access to patient records, which improves diagnosis and patient monitoring. Miller and Tucker will be honored at a reception at the American Association for the Advancement of Science (AAAS) building in Washington, DC, on Thursday, November 15, 2012. 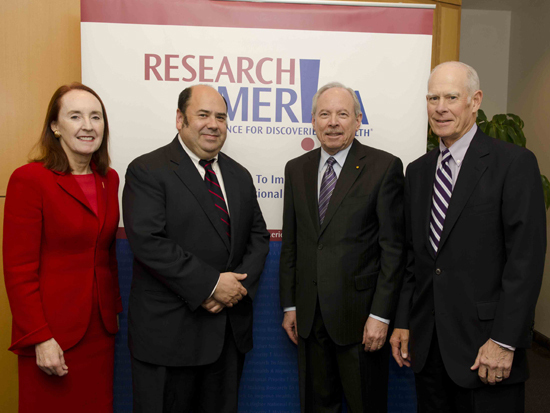 The reception is preceded by a post-election panel discussion about the outlook for medical research and innovation. WASHINGTON, DC—November 15, 2012—On the Monday before Thanksgiving, Research!America and leading U.S. public health organizations recognize public health professionals who work tirelessly every day to protect the health of all Americans. Public Health Thank You Day 2012 honors all those unsung heroes who keep our drinking water safe and air clean, develop vaccines, track and contain deadly illnesses and aid victims of devastating natural disasters. These everyday heroes include health inspectors, environmental health scientists, public health researchers, sanitation workers and many other dedicated workers. “In recent weeks, the nation’s public health response has been put to a tremendous test. First, with the multistate meningitis outbreak that resulted in both illnesses and deaths, followed closely by Hurricane Sandy, which had a devastating impact on much of the Northeastern United States,” said Centers for Disease Control and Prevention (CDC) Director Thomas R. Frieden MD, MPH. “These public health emergencies highlight the dedication of our public health heroes and responders. As we observe Public Health Thank You Day, I am deeply grateful for their commitment, preparedness and constant vigilance to stand ready to keep our nation safe from public health threats. In the recent meningitis outbreak, the CDC played a critical role identifying possible sources of contamination, tracking cases and communicating updates to citizens. During the height of Hurricane Sandy, the CDC provided emergency assistance and medical care to those affected, including food and water, medical supplies to prevent and treat injuries, clean-up and sanitation and mental health resources. Research!America’s Public Health Thank You Day partners include the Campaign for Public Health Foundation, the American Public Health Association, Association of Schools of Public Health, Association of State and Territorial Health Officials, National Association of County & City Health Officials, and the National Alliance for Hispanic Health. Organizations wishing to celebrate Public Health Thank You Day can find downloadable web banners and ads, communication tools, poll findings and a Facebook group at www.publichealththankyouday.org. Research!America is the nation’s largest not-for-profit public education and advocacy alliance working to make research to improve health a higher national priority. Founded in 1989, it is supported by member organizations that represent more than 125 million Americans. For more information, visit www.researchamerica.org. Each year on November 14, the International Diabetes Federation sponsors World Diabetes Day to raise awareness about the global burden of the disease. Although diabetes is historically associated with more affluent countries, diabetes rates are rising around the world. In 2000, about 170 million people had diabetes. Today, WHO estimates that diabetes affects more than 346 million people and about 70% of these individuals live in low- and middle-income countries. It is important to raise awareness of this growing burden and the links between diabetes and the infectious diseases that plague the developing world. Infectious diseases like malaria, tuberculosis and neglected tropical diseases are endemic in several developing regions and affect millions of individuals every day. Any of these diseases can be devastating on their own, but recent studies point to the additional hazards of suffering from an infectious disease and a noncommunicable disease like diabetes. For example, individuals with diabetes who contract dengue fever have a much greater risk of developing severe (and potentially fatal) symptoms. Similarly, studies at the University of Texas have shown that individuals with diabetes have an increased risk of contracting tuberculosis. Because dual infections are a significant health concern, more research is necessary to better understand the relationship between noncommunicable and infectious disease. Future research funding for either disease could have broad and unexpected applications. For example, diabetes research could yield additional insight into severe dengue fever or tuberculosis research might advance an understanding of diabetes. On World Diabetes Day, we must not only raise awareness of global burden of diabetes, but of the need to prioritize research to combat it and related infectious diseases. Climate Change May Increase Threat of NTDs in the U.S. The devastation caused by Hurricane Sandy has prompted a renewed discussion about climate change. Political leaders and climate scientists alike have raised concerns about the relationship between global warming and an increase in the number of extreme weather events. In addition to these concerns, climate change may also increase the threat of neglected tropical diseases (NTDs) here in the U.S. NTD transmission depends heavily on environmental conditions and warming temperatures may increase the severity or change the patterns of these diseases. For example, funded by a grant from the Department of Defense, researchers at Texas Tech determined that climate change will allow dengue to thrive in the U.S. Historically found only in tropical regions, rising temperatures will allow the range of dengue-infected mosquitoes to shift north, increasing the risk of dengue within the continental U.S. We may already be seeing the first evidence of this shift – three cases of dengue fever have been reported in Florida in the past few weeks. Similarly, climate change is one suspected culprit in this year’s West Nile outbreak, as CDC officials note that unusually warm weather in 2012 may have played a role. However, additional research is necessary to fully understand the impact of climate change on the range and transmission of NTDs. Even experts in the field have called for more research into the issue, arguing that “not enough attention is being paid to climate change in relation to NTD control.” They recommend improving NTD surveillance systems and increasing investment in field research, which will not only allow for the establishment of more effective NTD control programs worldwide, but will help the U.S. better understand and protect against these diseases here at home. Did you get a flu shot this year? Donate blood or give your time to health services? You are part of keeping our communities healthy, so thank you! In addition to your efforts, there are public health heroes around the county working tirelessly to protect our health each and every day. Even during the apogee of Hurricane Sandy, public health workers were providing emergency assistance and medical care to those affected. Please join Research!America and other leading public health organizations on November 19th, the Monday of Thanksgiving, to recognize the outstanding work of these public health professionals. To learn more about Public Health Thank You Day, please visit http://www.researchamerica.org/ph_thank_you or like our Facebook page at https://www.facebook.com/PHTD1. Pollard illustrates how the political climate has changed in the past decade. No longer can scientists leave the advocacy to others in favor of lab work. That shortsightedness could have potentially disastrous effects on funding for a lab or institution. Advocacy is particularly important due with government funding for scientific research in jeopardy with pending across-the-board budget cuts under sequestration. It is vital that scientists take the time to communicate with policy makers. In the past, Members of Congress such as Research!America Chair John E. Porter or the late Sen. Arlen Specter used their influence on Capitol Hill to champion funding for research. But it’s time for a new generation of politicians willing to speak on behalf of scientists. Finally, Pollard notes several obligations of scientists which will enable successful advocacy both locally and in Washington. Those obligations include joining a professional society with an advocacy program and participating in their grassroots efforts. Scientists should also visit their representatives to explain how science is important to both individuals and communities at large. Finally, scientists should let their elected officials know about the funding of grant applications, whether by thanking them when a grant is funded or by explaining the impact of the lack of funds. These steps will help to promote science as a valuable cause for better health and economic prosperity. Pollard’s article should serve as a wake-up call to scientists who believe that their funding will remain stable or increase without a significant effort on their part. Scientists must educate lawmakers about the benefits of biomedical and health research and step up efforts to find new champions for the research enterprise.